“Generic” is not a word that should be used to describe Lisbeth Salander, but The Girl in the Spider’s Web brings her close. An adaptation of the book, the latest installment in the so-called Millennium Series, continued by David Lagercrantz from where late crime journalist and author Stieg Larsson left off, and a soft reboot quasi-sequel to The Girl with the Dragon Tattoo, adapted to film both in Sweden (by Niels Arden Oplev and starring Noomi Rapace and the late Michael Nyqvist) and in an English-language remake (by David Fincher and starring Rooney Mara and Daniel Craig), The Girl in the Spider’s Web continues the series transition in Lagercrantz’s hands from dark, serious, slow burn murder/crime mystery into more straightforward action/spy thriller territory, sacrificing some depth and character along the way. The result is a watchable and engaging action/spy thriller but arguably a poor Lisbeth Salander story. Years after the events of The Girl with the Dragon Tattoo, super-hacker and vigilante Lisbeth Salander (Claire Foy), now both admired and dreaded in different circles as “the woman who hurts men who hurt women”, is recruited by a jittery scientist, Frans Balder (Stephen Merchant), who created a top-secret computer program capable of overriding and controlling every nuclear weapon system in the world, to steal back and destroy the Pandora’s Box he opened. But Lisbeth is not the only person seeking the program. When Lisbeth hacks the United States’ National Security Agency and downloads the program from its own files, she gets NSA Agent Needham (LaKeith Stanfield) flying to Stockholm to track her down, and she, Balder, and Balder’s autistic math prodigy son (Christopher Convery), who might be the only person capable of solving his father’s password riddles, become targets of a mysterious and ruthless crime syndicate determined to get its hands on the program. Lisbeth is forced to turn to her former partner/lover, investigative journalist Mikael Blomqvist (Sverrir Gudnason), with whom she has testy relations due to their past experiences and her unresolved feelings. Distilled to its essence, The Girl in the Spider’s Web is a generic espionage crime thriller. The movie is briskly-paced and considerably more action-oriented than its predecessor—although the action is largely generic, not especially ambitious, and unmemorable—and the plot is busy without being convoluted to the point of being difficult to follow. While she’s moved into more straightforward anti-heroine territory here, Lisbeth’s prowess isn’t elevated to superhuman levels; she gets hurt and captured, and while she can hold her own in a hand-to-hand fight, she’s not Jason Bourne, and relies more on her super-hacker skills (which, as is often the case in movies, are taken to the verge of omnipotence) than on brute force. Director Fede Alvarez attempts to emulate the dark, hyper-stylized opening credits of David Fincher’s film. Alas, depth is sacrificed in favor of more straightforward generic action. One of Fincher’s film’s biggest attributes—a brooding, suffocating atmosphere—is missing. The cold, snow-gripped Swedish setting is retained, but Alvarez treats it like window dressing rather than making it an integral aspect of the film’s vibe. Everything feels watered-down and shallowly-explored. Horrors of past sexual abuse, which were treated with jarring forthrightness in Fincher’s film, are skirted around and alluded to here. Mikael Blomqvist, who was an equal—or nearly so—partner and love interest to Lisbeth in Oplev and Fincher’s films, is a shallow pale shadow of himself here, and feels like an obligatory throw-in than a co-lead. Neither Mikael himself, nor his uneasy, ambiguous dynamic with Lisbeth is treated with any depth or substance (just compare to the dynamic between Rooney Mara and Daniel Craig in Fincher’s film). 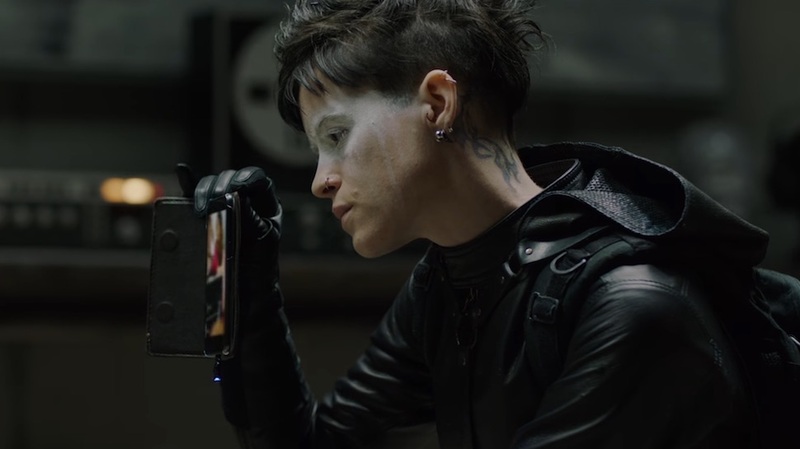 Even Lisbeth’s look here is watered-down; for lack of a better word, Claire Foy’s Lisbeth looks more “normal” than Rooney Mara’s edgier version. Lisbeth Salander was never really intended to be an action heroine, at least not of the conventional sort, but that’s what the story tries to shoehorn her into here, with the girl who once rid the world of run-of-the-mill sexual perverts and serial killers coming up against pseudo-Bond villains with a Bond villain-esque plot (overriding defense systems to launch nuclear weapons across the world), right down to borrowing a page from Spectre and serving up a female pseudo-Blofeld who happens to be the heroine’s evil sister (the “evil sibling”, “genius autistic child”, and “albino villain” tropes are all present and accounted for). That might be fine for James Bond, but it’s not really Lisbeth Salander’s kind of thing, and trying to be a Lisbeth Salander story and a Bond-ish spy/action thriller at the same time only leaves it being mediocre at both. 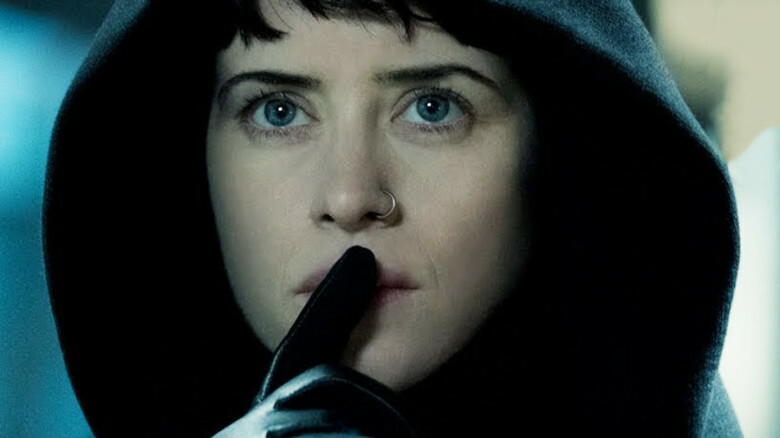 Stepping into the shoes (and tattoos and piercings) of Lisbeth Salander, Claire Foy becomes the third actress to tackle the character, following Noomi Rapace and Rooney Mara. In a sense, this is a logical progression of the career trajectory Foy began with a young Queen Elizabeth on the BBC series The Crown and built on by playing strong-willed wives in last year’s Breathe and the other movie in which she can still currently be seen in theaters, First Man. Foy is fine, but it’s like the difference between Jodie Foster and Julianne Moore as Clarice Starling. Rapace and Mara had far meatier material, leaving Foy’s more straightforward interpretation feeling shallow and watered-down not necessarily through any fault of her own. Mara’s intense, edgy portrayal of Lisbeth, combining ferocity with fragility, earned her a deserved Oscar nomination; Foy won’t be nominated. Both an actress of Foy’s caliber, and a character as interesting as Lisbeth deserve a better story than this. Sylvia Hoeks, looking nothing like Blade Runner 2049‘s Luv, cuts a striking figure with her ghostly pale features and blood-red wardrobe (albeit serving up another entry in the overused “albino villain” trope) but is a shallowly-developed “evil sister” villain until a poignant monologue where she outlines the reasons for her resentment of Lisbeth in their climactic one-on-one confrontation, which is a well-acted moment between the two actresses and, while resolving itself in somewhat anti-climactic fashion, is lower-key and more emotion/character-driven than the half-expected hand-to-hand catfight). Sverrir Gudnason’s shallow and uncharismatic interpretation of Mikael does nothing to improve what’s on the page, and leaves one missing Daniel Craig’s version of the character. Of the other couple recognizable faces onhand, Stephen Merchant is underused and LaKeith Stanfield is underdeveloped. The Girl in the Spider’s Web might play better to those who simply approach it as an action/spy thriller, while its issues will be more irksome to those with more attachment to the earlier adventures of Lisbeth Salander and Mikael Blomqvist. As a pseudo-Bondian espionage thriller, it’s watchable and even engaging. But awkwardly shoehorned into a Lisbeth Salander story, it’s unsatisfactory.